The U.S. Army Corps of Engineers implements the lake’s regulation schedule for flood control, navigation, water supply and the environment. 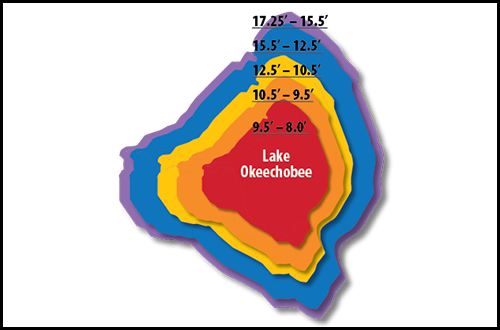 The federal regulation schedule prescribes operational action to manage Lake Okeechobee’s water levels between 10.5’ and 17.25’. The purpose of these operations range from the release of water for the protection of communities (during the wet season) to the conservation of water for water supply to South Florida (during the dry season). See the infographic for a breakdown of the impacts of operating the lake as water levels are lowered.